Do you feel like your life is limited but you are not sure why? Have you had lots of negative experiences in your life that have left you unable to trust others around you? Have you grown up around depression? Do you struggle with loving you? Are you struggling to have successful love relationships? Have you reached a point of wanting to positively change? Are you open to consider new ways to live your life? If you answer YES to any of these questions, this book is perfect for you. In 2011 Sarah received a spiritual awakening that changed her life forever. Since this day Sarah has been discovering new ways to live her life that have created positive change for both her and her children. By reading this book you will discover how she did it that you too can do the same. 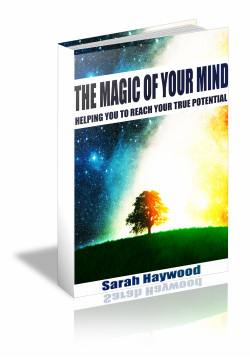 This book is aimed at bringing awareness to you of the power of your mind. It will particularly help those who are just beginning to question their lives and the purpose of them. It will also enhance the knowledge of those who have already begun on this journey and are seeking confirmation of what they already know. It is written in a way that is simple to understand and will provide you with clarity as to how you can improve things in your life by changing simple things within it. There have been many self help books written. Some of them are complicated and long winded. This book has been kept concise and easy to read in order to overcome these issues and present information to you that will bring you closer to reaching your true potential. The evolution of mankind has taken a turn into a more spiritual way of being. This transition relies on people learning how to change their old patterning of the past. Sandalphon, Melchizedek and Uriel are Archangels and they have chosen to collaborate their knowledge and understanding of what is happening on the earth currently to give those who read it a different perspective to what they may already know or to to give confirmation to those who are already aware. This book is the first in the trilogy. Sandalphon is the Archangel in charge of the Earth. 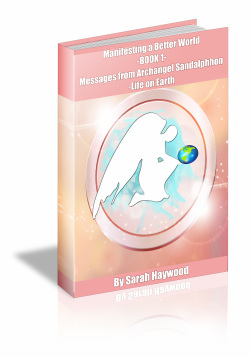 Sandalphon is passionate about all that exists on the earth and is keen to bring awareness that will give reassurance that mankind can live a more harmonious and loving life. Sandalphon has looked at many areas of the earth and its current state of being and given advice from their higher perspective as to how these areas may be improved in order to bring a better experience to all who live on the earth now and in the future. These books are channeled by Sarah Haywood. Sarah has been chosen as she is able to present the work as it comes to her. This allows the words to be untainted and pure as is their intention. These are important times of change and as such it is imperative that help from higher beings is able to find its way into the hands of all people who choose to read it. This knowledge and understanding will ignite the awareness and knowledge that is already sitting within all. it will be down to the individuals as to how much they wish to implement it into their lives. There are many people over time that have been crying out for peace on earth. The archangels have listened. They have decided to collaborate together to bring information through many channels that will help give the answers on how this can be achieved. 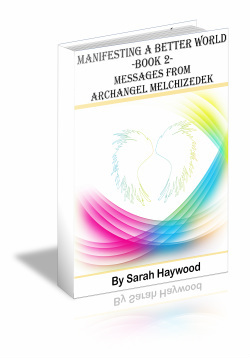 This book is one view from Archangel Melchizedek who is the angel of peace. It is apparent that we are in changing times. During these times there are many questions being asked as to how to improve the lives of many. In this book Melchizedek explains the effects of current ways of thinking upon the earth and how collectively mankind can begin to change things, if they begin to unwind old patterning from the past and create new ones. Melchizedek explains about the Golden Age that we are in and how this will impact on those upon the earth. Included is much information about individual subjects that will be very close to many people's hearts. The more who read such information, the more quickly change can occur on the earth and a brighter future can be created for all upon the earth. The effects of what is happening now is not only impacting on those currently living on the earth but also all those yet to be born. If mankind does not begin to take heed of the information that is coming through to them, the effects could be devastating. If you are questioning your life and the way we live, this book will lead you to ways of thinking that will not only resonate with you but will also help you to begin to feel strong enough to make the changes within yourself that could then have a positive impact on others around. Are you ready to make the changes necessary that will leave a positive lasting legacy for all those yet to be born? If so, this trilogy of books will give you a good foundation of knowledge to start you off or help you to expand further what you already know. Archangel Uriel has come together with Archangels Sandalphon and Melchizedek to bring to you a trilogy of books that invite you to take a philosophical look at the way the planet earth is currently and how we might manifest a better world for future generations to come. For many the world has become a challenging place to be and this feeling of difficulty is impacting on the energies of the earth. These challenges are the result of old ways of thinking which have been embedded deep within societies and countries for many years. To help overcome these, the Archangels have put together a collection of information that is likely to invoke a positive response within you if you are at the point when it will resonate with you. Everyone is capable of living a life that is happy and free. Each person is able to individually and collectively bring changes into their lives that will have a positive impact on those who are born now and in the future. The Archangels have lived upon the earth for many years before reaching their higher status. Archangel Uriel is known as the Light of God. Uriel is able to impart information, wisdom,,inspirational insights and epiphanies into people's lives to help bring them closer to living from their own higher purpose. If you have begun to question the way people are living today and are feeling uncomfortable with it, these books will give you the reassurance you need to begin see the reasons behind this and how you may begin to adapt your life and your thinking in order to bring about positive change for you.